We’d love your help. 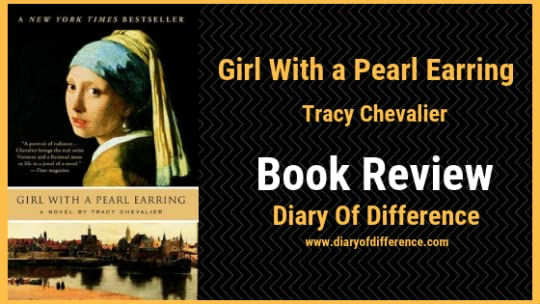 Let us know what’s wrong with this preview of Girl with a Pearl Earring by Tracy Chevalier. With precisely 35 canvases to his credit, the Dutch painter Johannes Vermeer represents one of the great enigmas of 17th-century art. The meager facts of his biography have been gleaned from a handful of legal documents. Yet Vermeer's extraordinary paintings of domestic life, with their subtle play of light and texture, have come to define the Dutch golden age. His portrai With precisely 35 canvases to his credit, the Dutch painter Johannes Vermeer represents one of the great enigmas of 17th-century art. The meager facts of his biography have been gleaned from a handful of legal documents. Yet Vermeer's extraordinary paintings of domestic life, with their subtle play of light and texture, have come to define the Dutch golden age. His portrait of the anonymous Girl with a Pearl Earring has exerted a particular fascination for centuries - and it is this magnetic painting that lies at the heart of Tracy Chevalier's second novel of the same title. To ask other readers questions about Girl with a Pearl Earring, please sign up. I love this painting, but I have not read this book yet. Who this girl was still remains a puzzle. I am curious about this imaginary story. Hopefully, it will give me another perspective to appreciate this painting. There is also a movie based on this novel. Does anybody have read this book and also watched that movie? Is it good? Will it be better if I watch the movie first, and then read this book? Thank you! Is there questions in the back of the book for book clubs? Another one of my wife's recommendations (I read a lot of books that way), I picked it up from the bookshelf the night we came back from seeing the film with Scarlett Johansonn and Colin Firth. I loved the movie--it was just so incredibly sumptuous--and was curious to know the story in the novel, which I knew from experience, and from my wife's continuous comments, would be different, more detailed. I was right. Chevalier has won a place in my heart and bookshelf. Her novels are well-crafted, sim Another one of my wife's recommendations (I read a lot of books that way), I picked it up from the bookshelf the night we came back from seeing the film with Scarlett Johansonn and Colin Firth. I loved the movie--it was just so incredibly sumptuous--and was curious to know the story in the novel, which I knew from experience, and from my wife's continuous comments, would be different, more detailed. I was right. Chevalier has won a place in my heart and bookshelf. Her novels are well-crafted, simple to follow, and addictive; Girl was no exception. The story of the maid Griet in 1600's Delft, Holland, was amazing in its simple prose and endless emotion. Completely fictional (no one knows who exactly were the models for any of Vermeer's paintings), it nonetheless possesses a veracity that makes you believe Chevalier found the long-lost journal of this unknown woman and wrote her novel based on it. The details of seventeen century Holland are rich; you feel you are walking the canal-lined streets of Delft, smelling the pungent scents of the Meat Market, holding your breath as Vermeer paints next to you. Griet is a wonderful protagonist, taking you into her world, yet retaining a few secrets for herself, especially where Vermeer is concerned. I know almost nothing about art, but even I can tell that Girl With a Pearl Earring by Johannes Vermeer is a brilliant painting; 'captivating' is probably the best word to describe it. One presumes that Chevalier agrees with me, and this is what lead her to write a novel about the painting, its subject and its creator. So, is the novel as captivating as the piece that inspired it? The short answer would be 'no'. Chevalier is probably one of the best-known historical nov I know almost nothing about art, but even I can tell that Girl With a Pearl Earring by Johannes Vermeer is a brilliant painting; 'captivating' is probably the best word to describe it. One presumes that Chevalier agrees with me, and this is what lead her to write a novel about the painting, its subject and its creator. So, is the novel as captivating as the piece that inspired it? Chevalier is probably one of the best-known historical novelists of the last ten years, with this book always in the foreground when she is discussed. As far as historical information goes, I think she does okay with it. I had a pretty clear picture of the Netherlands in the seventeenth century by the time I was done with the book (whether or not its accurate or not is another matter), but I felt at times that there wasn't that detail that critics proclaimed about on the cover. The characters, I feel, are never truly developed. Vermeer himself remains a mystery throughout, even to the protagonist and narrator, Griet, who appears to have some connection with him. Griet meanwhile, is what I would describe as a stock teenage girl character. She is similar to many characters I've read before, and yet she does not really advance on that. The narrative style is one that I would have adored at 14, but by now find to be pedestrian. This is first person narrative at its simplest (and blandest) and I don't feel that we gain anything from it - the novel may just as well have been in third person and would not have suffered for it. It may even have benefited from it. The structure is interesting. Split into parts that represent years, rather than having chapter breaks makes it difficult to find a stopping place at times, and it is this more than anything else that makes a page turner of the novel. Meanwhile, the entire thing seems to be building to the inevitable moment when Vermeer will paint Griet. The scenes are handled with less intensity than I had hoped for from the build up, and once the painting is finished, Chevalier seems to want nothing but for the novel to be over too, and closes it down rather too quickly. Perhaps the fact that little is known about Vermeer's life would imply that a fictional version of it would be easy to tell. Sadly, the gaps in knowledge seem to be too big to fill. At the end of the novel, I had discovered how this work came about, the girl staring out from it, but still had almost no real idea of the man behind it. It is, in my opinion, a failure in this respect. I approached this novel trepidatiously. How could I ever suspend my disbelief with this work? How could I ever believe such a ridiculous tale about Vermeer and one of his most revered paintings? I must admit that I opened this novel expecting to utterly detest the lies it weaves. By page two I realised that I was an idiot who should never be listened to. Griet is hired as a maid to the Vermeer family in Delft. This novel supposes that Griet the maid was the sitter for Vermeer's great work Girl w I approached this novel trepidatiously. How could I ever suspend my disbelief with this work? How could I ever believe such a ridiculous tale about Vermeer and one of his most revered paintings? I must admit that I opened this novel expecting to utterly detest the lies it weaves. By page two I realised that I was an idiot who should never be listened to. Griet is hired as a maid to the Vermeer family in Delft. This novel supposes that Griet the maid was the sitter for Vermeer's great work Girl with a Pearl Earring. However that is not the story, or at least it is only a small part of it. The novel mainly concerns the inner workings of the Vermeer household and Griet's attempts to keep everything in control. It is a fantastic character study and I do admire Chevalier's bravery in using the first-person narrative. Whilst I will admit that at times Griet's dialogue is somewhat stilted and some lines are just downright odd ('His smile made me grip my broom tightly' was one line that made me chuckle due to its utter ridiculousness), she is never an annoying or tiring character. Girl with a Pearl Earring is a 1999 historical novel written by Tracy Chevalier. 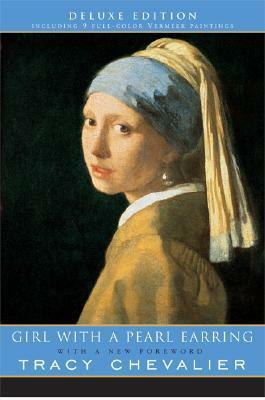 Set in 17th century Delft, Holland, the novel was inspired by Delft school painter Johannes Vermeer's painting Girl with a Pearl Earring. Chevalier presents a fictional account of Vermeer, the model, and the painting. The novel was adapted into a 2003 film of the same name and a 2008 play. So the parts when Vermeer was actually being a painter were interesting. Seeing as I slogged through this on account of a recommendation that arose from an art-class lecture on Vermeer, I was hoping that the art stuff would at least deliver. But it's not a good sign when a book's most compelling moments revolve around two people grinding pigments. And, no: "Grinding pigments" is not a euphemism for artist-bangin'. It is, quite literally, referring to the detailed descriptions of how paint was ma So the parts when Vermeer was actually being a painter were interesting. Seeing as I slogged through this on account of a recommendation that arose from an art-class lecture on Vermeer, I was hoping that the art stuff would at least deliver. But it's not a good sign when a book's most compelling moments revolve around two people grinding pigments. And, no: "Grinding pigments" is not a euphemism for artist-bangin'. It is, quite literally, referring to the detailed descriptions of how paint was made in the days before those fancy metal tubes replaced pig bladders as the paint-storing vessels of choice. This was the most predictable book I've read in a while, and that includes the two graphic-novel series that are simply retelling stories I know well in a new medium. I knew exactly where the plot was going within the book's first dozen pages. Every subsequent thread was introduced with the subtlety of a sledgehammer and the writerly finesse of a 14-year-old's first attempt at fanfiction. It was also pretty obvious what stereotype everyone was going to play from his or her very first appearance. There really isn't a multi-dimensional character in this book. I understand that the first-person voice is a limited perspective by its nature, and I would write it off as just that if the peripheral characters were the only flat archetypes, but even the narrator doesn't carry any convincing weight. Griet is the protagonist because she's the main character. And because all of the characters with whom she has scuffles are inexplicably bitchy. Not giving characters any real motivations, not making them behave and interact believably, and generally preferring to tell rather than show all contributed to making this whole book feel sloppy, underdeveloped and rushed. If "Girl with a Pearl Earring" was maybe 200 more pages of really hammering out the story and its players, maybe then it'd be a more satisfying read. At least it's mercifully quick and mostly painless at its current length. I say "mostly painless" because there are some groan-worthy lines showcased here: While more pages would have maybe benefited the plot, there is nothing -- save for a control-freak editor -- that could have improved the prose itself. I could not get past the clunky writing. It didn't take me long to get violently annoyed by the author's fondness for hitting the reader over the head with the most obvious attempts at subtle foreshadowing by way of forcing too much weight on these flimsy, laughably ominous one-sentence paragraphs. There were numerous other technical things that kept grating on me about the writing and its myriad shortcomings. Among them: Griet saying things like "I always regretted that decision" to indicate that she's looking back on a time that is very clearly written as the present; not one character shows any development throughout the novel; sixteen-year-old Griet, the daughter of a tile painter, somehow knows more about painting and composition than Vermeer, a professional artist who actually managed to garner some fame during his living years. Even when the book pissed me off (which was often), I will admit that I never found Griet herself to be irritating (maybe because I kept fantasizing about Scarlett Johansson to save my brain from oozing through my ears?) -- but I was irked at how it felt like Chevalier was Mary Sue-ing her way through the character. The way that every man whom Griet encountered in the whole! damn! book! fawned over and flirted with her, the way she was presented as being uneducated but naturally clever just because she sometimes spoke her mind and separated her chopped veggies by color, the way Griet's family was painted as these simple, sheltered little Protestants who knew nothing of the world around them.... there was far too much black-or-white for me to take anything about the book seriously. -- Vermeer, for being the central male character, remains an enigma. It's not that he's shrouded in an air of charming mystery but rather that his personality is nothing more than a bunch of suppositions that Griet "just knows" about him. -- Griet does not ever refer to Vermeer as anything other than "he" or "him". Not. Once. It made her sound like a starstruck teenybopper and it undermined any sense of genuine affection between the painter and his maid. I CAN'T SHOUT "MEH!" LOUD ENOUGH!!! (Sorry, I was daydreaming)...had me expecting a tumultuous romance, a grab-ya and hold-ya reading experience. But this...I don't know what this was, but it wasn't exciting in the least. Girl With a Pearl Earring is about a maid, who becomes a model, who gets her picture painted and attracts the notice of a few men. The painter is famous, so tha I CAN'T SHOUT "MEH!" LOUD ENOUGH!!! Girl With a Pearl Earring is about a maid, who becomes a model, who gets her picture painted and attracts the notice of a few men. The painter is famous, so that's interesting. His patron is rich, of course, and expects to get what he wants, so there's your villain...kind of. Really, our protagonist's main enemy is jealousy. But that enemy's effectiveness is quashed by another force: money. And that leaves us with a less dramatically, emotionally affecting book. I read through to the end, expecting something bigger to happen the whole way, but even though it never did, I did still manage to get through it all, so there's something to be said for that. In the end, however, this book has to say about as much as does a picture of a beautiful woman. Not much. My overly sensitive and irrational wife would like me to take down my Johansson picture collage homage from the ceiling over our bed. But as I've explained, ScarJo needs the support of her #1 fan! Beautifully written and read aloud, this is an imagining of the possible life of the girl depicted in Vermeer's lovely painting. This was a pleasant diversion. This novel about a pretty maid who appeared in one of Vermeer's paintings is easy to slip into, didn't ask much of me, and kept me entertained for a few days. Is it great literature? No. Was it turned into a decent movie? Yes. Would I recommend the book? Depends. The plot skips along well enough, and I enjoyed how the author invented stories for some of Vermeer's famous paintings. My copy was a deluxe edition that included pictures of his artwork, which I appreciat This was a pleasant diversion. This novel about a pretty maid who appeared in one of Vermeer's paintings is easy to slip into, didn't ask much of me, and kept me entertained for a few days. Is it great literature? No. Was it turned into a decent movie? Yes. Would I recommend the book? Depends. The plot skips along well enough, and I enjoyed how the author invented stories for some of Vermeer's famous paintings. My copy was a deluxe edition that included pictures of his artwork, which I appreciated. However, the writing is competent but forgettable, and I didn't find any exceptional quotes to share. I hadn't seen it until a few months ago, in a class I was taking at the university called “film appreciation”. My professor wanted to show us the movie that goes by the name of this painting because he wanted to illustrate some concepts present in the movie and many other things. Well, at the end of the movie, in the credits (yes, I read the credits; besides, the music was amazing), it said “based on the novel by Tracy Chevalier”, so I told my self “why, it was based upon a book, therefore I should read it”, and that's why I decided to read it. Girl with a Pearl Earring was an interesting book to read. First of all because it features a famous painter, Johannes Vermeer; secondly, because the story is narrated from their maid's point of view; and finally, because we get to see how society was back in the seventeenth century. The story follows Griet, a young girl who gets a job as a maid in Vermeer's house. Since she first came to the house, she is hated by her mistress, Tanneke (the other maid) and Cornelia (one of the uncountable children Catharina had), but she gained something far more precious. She gained Vermeer's interest. Our heroine –Griet— is one of those characters who develop in the course of the story. She starts from being completely innocent and shy, and grows from there. At the end, she's still innocent, but she has changed. She has a particular obsession in hiding her hair with a cap, because her not showing her hair makes her be herself. Without her cap, she is “one of those women”, and she is not like that. Vermeer is great. I loved him and his dedication. I also loved his relationship with Griet. It's not a romance, mind you, but it was obvious he cared for her, and the same applied the other way round. His personality was very intriguing too: He was always so calm and isolated from the world, even when there were many people in the same room as him. It always felt as if he was alone, and I don't know, that made him stand out. The writing is beautiful. Simply brilliant. You could feel as if you were present in 1600's Holland. The details were enough to please you, but they were not overwhelmingly enough to tire you. It was perfect. In the seventeenth century, in Delft, a thriving Dutch city, everything had a pre-established order. Rich and poor, Catholics and Protestants, bosses and servants, everyone knew their place. When Griet went to work at the home of the painter Johannes Vermeeer, she thought she knew his role: doing the housework and taking care of the painter's six children. No one expected, however, that her delicate manners, her insight and her fascination with the master's paintings would draw her inexorably in In the seventeenth century, in Delft, a thriving Dutch city, everything had a pre-established order. Rich and poor, Catholics and Protestants, bosses and servants, everyone knew their place. When Griet went to work at the home of the painter Johannes Vermeeer, she thought she knew his role: doing the housework and taking care of the painter's six children. No one expected, however, that her delicate manners, her insight and her fascination with the master's paintings would draw her inexorably into her world. I have read this book so many times. And even after re-reading this book so many times, it is and will always remain one of my favourite books, a story that is evergreen and has such an emotional story worth retelling. Tracy Chevalier has been inspired by the artwork of Johannes Vermeer, and his most famous painting, the Girl with a Pearl Earring, that she decided to write a story of what she believes might have happened behind that painting. For me, when looking at paintings, this is one of the things that cross my mind – what is the actual story behind it, what was the relationship between the painter and the people on the painting, what were they all thinking and what did their lives look like… In this book, we are able to enter this world, where we see a story of what might have happened here, and this story is a wonderful experience. This is a story about Griet’s life. Griet lives in a house with her poor family, a blind dad who worked all his life to gather a bit of money for them, and a mother that always fought for the family. With their money running low, Griet has to go and work as a maid in the house of Vermeer, who is a famous painter. Even though quite young, Griet quickly knows her tasks, to iron, to cook, to grab groceries from the market, and the most important bit – to stay out of everyone’s way and do her job. In the house, things are not easy. Griet is not treated with respect, her family is worried about her, the plague kills her sister and the butcher’s boy wants to marry her. Griet doesn’t feel anything for this boy, but having meat on the table every day for her and her family is too big of an advantage to be just thrown away. I personally never liked the butcher boy, because he knew very well what his advantage was, and he kept reminding Griet how she depends on him to feed her family. But Griet has a secret crush on Mr. Vermeer, and a great admiration for his work. And Mr. Vermeer notices Griet’s curiosity and gives her tasks around the studio, which in the end, results in him painting her. Griet gets to be involved in his world, learning what he does, and working for him in secret, while his wife is bearing another child of his. Even though Griet secretly feels like she is betraying the wife, she can’t help but feel joj when Vermeer pays attention to her. Now, in the 21st century, it is normal for ladies to pose, and be painted, but in that time, it was a disgrace for a maid to be painted. Men didn’t have the respect towards women as they do now (some of them). And when Griet finds herself being painted, she knows the consequences, but as a maid, she has no voice to object. She knows this quite well. In the end, the story is very powerful and heartwarming. While we read about how Griet sees and thinks, we will start to love her, watch her grow, and learn so much. I am forever grateful I have found this book. I have read the 20th Anniversary Edition of this amazing book, which was kindly sent to me by the publishers, The Borough Press, and Love Reading UK, in exchange for my honest review. I wrote a paper on artistic expression using Girl with a Pearl Earring as a source, since it is a painting, a movie, and a book. It provided me fascinating fodder, a really good read, and a good grade on my paper. This is a wonderful study in repression and tiny details. There are some beautiful passages. I absolutely love the study done of the character of Vermeer. 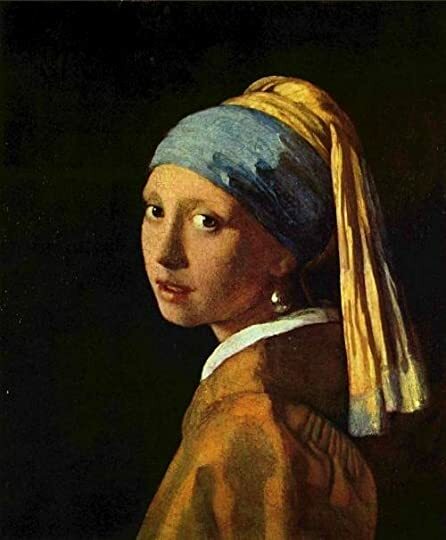 At one point, a character tells Griet (the imagined Girl with a Pearl Earring) to be careful, since Vermeer does not see her, but r I wrote a paper on artistic expression using Girl with a Pearl Earring as a source, since it is a painting, a movie, and a book. It provided me fascinating fodder, a really good read, and a good grade on my paper. This is a wonderful study in repression and tiny details. There are some beautiful passages. I absolutely love the study done of the character of Vermeer. 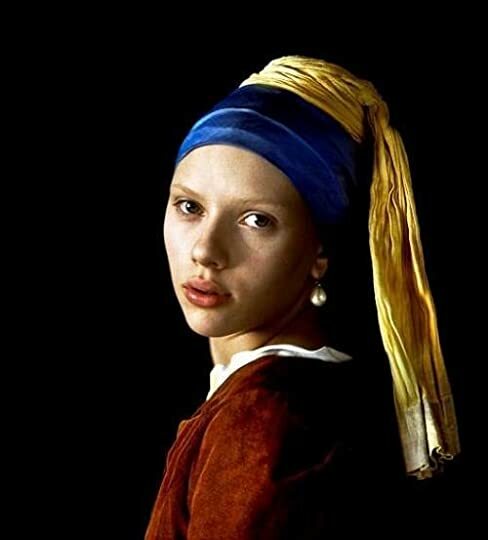 At one point, a character tells Griet (the imagined Girl with a Pearl Earring) to be careful, since Vermeer does not see her, but rather the painting that she will make. The artist sees the world only as paintings, not as people. This is shown as incredibly selfish. He loves only those things that fit into his sense of light and shape and color and tone. He has no interest in that which does not add to his work. This book features one of my favorite book heroines of all time. Griet is competent, intelligent and observant. She possesses the laudable ability to maneuver 17th century Delft in a shrewd and practical manner while still retaining her love of art; finding beauty in even mundane things. Griet has a first-rate mind, concealed in the body of - essentially - a peasant. This poor maid is the only person who truly understands Vermeer's work. The relationship she develops with the painter is satisfyin This book features one of my favorite book heroines of all time. Griet is competent, intelligent and observant. She possesses the laudable ability to maneuver 17th century Delft in a shrewd and practical manner while still retaining her love of art; finding beauty in even mundane things. Griet has a first-rate mind, concealed in the body of - essentially - a peasant. This poor maid is the only person who truly understands Vermeer's work. The relationship she develops with the painter is satisfyingly subtle; a nuanced understanding which never falls into the trap of passionate declarations or overwrought pining. In fact, the thing I like about Griet the most is that she never even flirts with self-pity or self aggrandizement. She knows who she is. این کتاب نوشته تریسی شوالیه (Tracy Chevalier) نویسنده فرانسوی- سوئیسی است که این کتاب را در امریکا و به عنوان دومین اثرش منتشر کرد و با استقبال زیاد مخاطبین و منتقدین مواجه شد. این رمان در تلاش است که با تکیه بر آثار نقاشی یوهانس ورمر (Johannes Vermeer) ، نقاش هلندی 1675-1632، و جمع آوری اطلاعات تاریخی درباره شرایط اجتماعی زندگی در هلند قرن هفدهم به بازسازی و یا بازتعریف زندگی ورمر بپردازد. محور اصلی این کتاب تابلوی دختری با گوشواره مروارید (Girl with Pearl Earring) است، که شوالیه دختر این تصویر این کتاب نوشته تریسی شوالیه (Tracy Chevalier) نویسنده فرانسوی- سوئیسی است که این کتاب را در امریکا و به عنوان دومین اثرش منتشر کرد و با استقبال زیاد مخاطبین و منتقدین مواجه شد. این رمان در تلاش است که با تکیه بر آثار نقاشی یوهانس ورمر (Johannes Vermeer) ، نقاش هلندی 1675-1632، و جمع آوری اطلاعات تاریخی درباره شرایط اجتماعی زندگی در هلند قرن هفدهم به بازسازی و یا بازتعریف زندگی ورمر بپردازد. محور اصلی این کتاب تابلوی دختری با گوشواره مروارید (Girl with Pearl Earring) است، که شوالیه دختر این تصویر را به عنوان راوی داستانش انتخاب می کند و با وی به درون زندگی شخصی و کاری ورمر سرک می کشد. اکثر آثار ورمر پرتره هایی از طبقه معمولی و بورژوا در حین انجام کار یا زندگی روزمره اند. تنها اثر وی که هیچ توجهی به حرفه، مکان و زمان مدل ندارد تابلوی دختری با گوشواره مروارید است. این تابلو که سال خلق آن بین سالهای 1675-1665 تخمین زده می شود با تکنیک رنگ روغن روی بوم نقاشی شده است و به خاطر زاویه مدیوم شات، لباس های خارج از عرف و تاحدی نامانوس، پس زمینه سیاه بدون درج و ثبت هرگونه وسیله، لوازم یا نشانه ای که به ما درباره این فرد و شرایطش آدرسی بدهد به شدت محل شک و حدس و گمانهای فراوان درباره هویت این مدل شده است. گمان ها برای شناسایی معمولا در سه فرد خلاصه شده است: ماریا ورمر (دختر بزرگ یوهانس)، مدلینا ون روی ون (دختر دوست و حامی یوهانس ورمر) و مدل گمنامی که در خانه ورمر به عنوان پیشخدمت کار می کرد. شوالیه با گمان سوم جلو می رود. در روایت شخصی شوالیه از این تابلو، این دختر، گری یت است؛ دختر یک کاشی ساز فقیر که برای کار و کمک مالی به خانواده اش به عنوان پیشخدمت به خانه ورمر نقاش می رود. وظیفه او علاوه بر انجام کارهای روزمره عادی نظیر شستن، اتو کردن، خرید و... تمیز کردن آتلیه نقاشی ورمر است. گری یت از 16 تا 18 سالگی در خانه ورمر کار می کند و در همان نگاه اول به ورمر دل می بندد و در خیال نوجوانانه خویش ورمر را هم دلبسته خود می پندارد. Girl With a Pearl Earring tells a short story using a lot of words. Even though the novel spans more than a decade, not too much of note happens besides Vermeer's painting. The book is more like an historical account of an ordinary life with occasional excitement sprinkled in. I got a little bored at times. I thought Tracy Chevalier spent too much time describing commonplace objects and scenes (washing clothes, dusting, shopping) and not enough time giving insight on Griet's character and the hou Girl With a Pearl Earring tells a short story using a lot of words. Even though the novel spans more than a decade, not too much of note happens besides Vermeer's painting. The book is more like an historical account of an ordinary life with occasional excitement sprinkled in. I got a little bored at times. I thought Tracy Chevalier spent too much time describing commonplace objects and scenes (washing clothes, dusting, shopping) and not enough time giving insight on Griet's character and the household drama. However I was never so bored that I considered DNFing this book. The plot was always moving forward, even if it was subtle. "I could hear rich carpets in their voices, books and pearls and fur." Those similes and metaphors were very well done. Tracy Chevalier did a wonderful job of centering the story around Vermeer by only ever referring to him with pronouns. Griet would think of Vermeer solely as "he" (or very rarely "my master", but never his name) and it gave the impression that Vermeer was the only man in the world to Griet. "I did not mind the cold so much when he was there. When he stood close to me I could feel the warmth of his body." "I did not like to think of him that way, with his wife and children. I preferred to think of him alone in his studio. Or not alone, but only with me." This book is gorgeously written. I love that Chevalier makes up all these lives to give a back story to just this one painting. Well, that's not true. 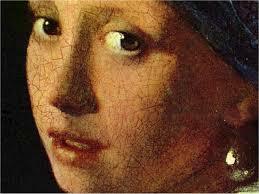 We actually see the painting of three or four of Vermeer's 35 through Griet's eyes. I know that I had to constantly pull up images of his paintings as I read to actually see what Griet was describing. I must also say that I have never been much of a Vermeer fan, but having read about Vermeer through Griet's eyes, I see his paintings as much more c This book is gorgeously written. I love that Chevalier makes up all these lives to give a back story to just this one painting. Well, that's not true. We actually see the painting of three or four of Vermeer's 35 through Griet's eyes. I know that I had to constantly pull up images of his paintings as I read to actually see what Griet was describing. I must also say that I have never been much of a Vermeer fan, but having read about Vermeer through Griet's eyes, I see his paintings as much more complex and studied than I had before. I hope Chevalier got the process right, because it would be a pity if he actually painted some other way. Vermeer hires Griet as a house girl for his wife and five children. 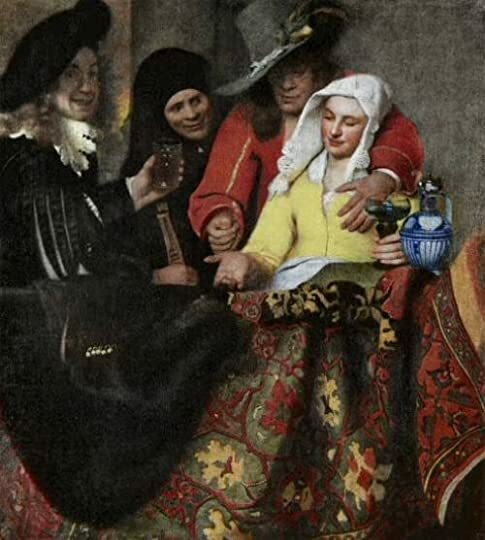 The Vermeer/Thin family are Catholics and women of that standing do not nurse their own children so there are likely to be more and more children. Griet is sorely needed. Vermeer and his wife Catherina come to Griet's home to meet her and the initial meeting comes across more as his hiring her for his own mysterious "pleasure", but when Griet arrives in their home she truly is a house girl. Nothing else. It takes much time for Vermeer to begin to use Griet to not only clean his painting studio, but to eventually run painting errands, mix colors, help him "see" the painting in hiding and eventually to model for him. Griet is the girl in the pearl earring. An earring, in a previously unpierced ear, belonging to Catherina. Talk about a scandal in the making. Um livro muito plástico e impressivo onde nos é aberta a porta da casa e do estúdio de um dos maiores expoentes da arte flamenga do século XVII, Johannes Vermeer. Da casa do pintor situada no Canto dos Papistas, as janelas abertas para a cidade de Delft permitem ao leitor sentir o pulsar de vida de uma típica cidade mercantil holandesa e divisar toda a amálgama social que nela se movimentava. As criadas, os açougueiros, os mercadores ricos, os modestos pintores de azulejos. 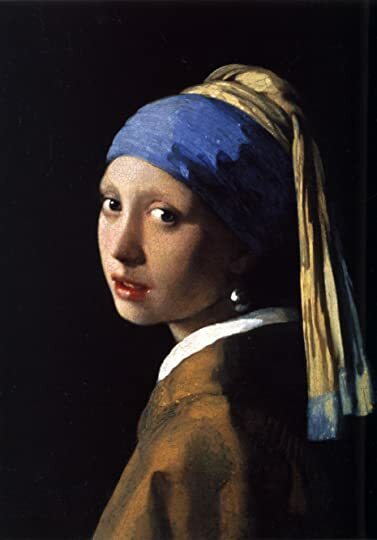 E tudo nos chega através do olhar atento e arguto de Griet, a criada dos Vermeer que, não deixando de ser uma mulher do seu tempo com todas as limitações que tal implicava, é impelida a escolher o seu destino. Story of a girl who goes to work as a maid in the Vermeer household. She is entranced with his paintings and also with his "mystique". His wife is jealous of Greit's beautify immediately. Vermeer's patron, a sleazy, domineering man, eventually orders Vermeer to paint a picture of Greit for himself. The portrait is done. Greit enjoys sitting for her Master and also assisting him with mixing paints, etc. She begins to feel affection for him and thinks he feels the same. There is also a "butcher's" s Story of a girl who goes to work as a maid in the Vermeer household. She is entranced with his paintings and also with his "mystique". His wife is jealous of Greit's beautify immediately. Vermeer's patron, a sleazy, domineering man, eventually orders Vermeer to paint a picture of Greit for himself. There is also a "butcher's" son who is in love with her and she eventually marries him. In the end Vermeer's wife orders Greit out of the house when she discovers the portrait. I enjoyed this book. The story is subtle making it the perfect example that less is more in a story. 1. The society of the time classified everyone as a "have" or a "have not". For a girl who was in between it was a matter of time before she was forced to one side or the other. She never fit in either world. 2. Clearly this girl had a raw, undeveloped talent for art. Had she lived in a different century would she have been the artist instead of the muse? Her role w I enjoyed this book. The story is subtle making it the perfect example that less is more in a story. 2. Clearly this girl had a raw, undeveloped talent for art. Had she lived in a different century would she have been the artist instead of the muse? Her role was so defined she didn't even question the possibility herself. 3. The fictional Vermeer was a coward. I hope the real one was not. 4. I didn't blame the wife. Would you? She had eleven children and a husband who cruelly excluded her from his art. 5. Be careful of the passion you feel for a painter with OCD tendencies when you're eighteen--it never lasts. 6. She should have kept the earrings and worn them with pride. 7. The painting is captivating. Εντάξει, πείτε ότι θέλετε αλλά εγώ δεν είμαι φαν της ζωγραφικής- ούτε που ήξερα ότι υπάρχει ζωγράφος με το όνομα Vermeer. Και ούτε που διάβασα το οπισθόφυλλο πολύ προσεχτικά, μπήκα στο βιβλιοπωλείο, βρήκα φτηνό βιβλίο, διάβασα τις πρώτες σειρές του οπισθόφυλλου και το πήρα. Και στην πορεία ανακάλυψα ότι αυτός ο ζωγράφος πράγματι υπήρξε!!! Οπότε από ένα σημείο και μετά διάβαζα βλέποντας ταυτόχρονα τα έργα που περιγράφονταν στο ίντερνετ και πραγματικά το χάρηκα. Και μπράβο στη συγγραφέα που κατάφε Εντάξει, πείτε ότι θέλετε αλλά εγώ δεν είμαι φαν της ζωγραφικής- ούτε που ήξερα ότι υπάρχει ζωγράφος με το όνομα Vermeer. Και ούτε που διάβασα το οπισθόφυλλο πολύ προσεχτικά, μπήκα στο βιβλιοπωλείο, βρήκα φτηνό βιβλίο, διάβασα τις πρώτες σειρές του οπισθόφυλλου και το πήρα. Και στην πορεία ανακάλυψα ότι αυτός ο ζωγράφος πράγματι υπήρξε!!! Οπότε από ένα σημείο και μετά διάβαζα βλέποντας ταυτόχρονα τα έργα που περιγράφονταν στο ίντερνετ και πραγματικά το χάρηκα. Και μπράβο στη συγγραφέα που κατάφερε να δέσει με όμορφο τρόπο αληθινά γεγονότα και να τα κάνει μια τόσο όμορφη ιστορία. Εκτός από τα έργα του ζωγράφου που περιγράφει, μου άρεσε η περιγραφή του τρόπου ζωής των υπηρετριών του 17ου αιώνα, σπάνια συναντώ βιβλία που περιγράφουν τη ζωή εκείνης της εποχής. I don't know if it has to do with my vacation days or the fact that I really, but really enjoyed reading this novel, but is was almost impossible to put it down, even though I'm not a big fan of historical fiction and I've watched the film 2 times already. Speaking of it, I'm sure there were many details left out, it's hard now to tell which, but it was definitely an advantage to put a face on the characters. My interest in art over the years was quite inconsistent and I started by liking the mod I don't know if it has to do with my vacation days or the fact that I really, but really enjoyed reading this novel, but is was almost impossible to put it down, even though I'm not a big fan of historical fiction and I've watched the film 2 times already. Speaking of it, I'm sure there were many details left out, it's hard now to tell which, but it was definitely an advantage to put a face on the characters. My interest in art over the years was quite inconsistent and I started by liking the modernists and surrealists, and by the time I met Vermeer I considered the Dutch masters (and many others for that matter) to be too old and classical for my taste. It was only in the last decade that I acknowledged them and still cannot put my finger on when I began to like Vermeer. Truth be told, Girl with a pearl earring is not a painting I particularly like, I tend to favour those that are sunlit, usually set in front of a window, like this, this or this, which later led me to love in the most absolute way the Danish trio, Ilsted, Holsoe and Hammershøi and their "Sunshine and silent rooms". But back to the book. I don't remember if the Protestants VS Catholics issue was much focused on in the film version, but it was quite interesting to follow it throughout the book, and from what I've read, Chevalier's first novel went even deeper into it. I terribly liked how Vermeer was always he, him or his for Griet and the Master and Servant relationship was very much to my taste! And I'm back to the film: having Colin's face and voice in mind really helped, sometimes my imagination needs help with faces but mostly voices. And now I must choose something as gripping as this or else I will end up struggling to finish Fry's memoir. An evocative look at life in Delft, Holland in the 1600’s. A quietly gripping tale of what might have been. The story is a fictionalised account of the circumstances surrounding the painting of Vermeer’s masterpiece ‘Girl with a pearl earring’. Griet, the central character, is a strong, honourable, modest and likeable character and the events that overtake her, because of the sensibilities of the age, are tense and exciting. The writing is smooth, exact and fluent. I would often flick to the cove An evocative look at life in Delft, Holland in the 1600’s. A quietly gripping tale of what might have been. Finished: Excellent writing. Each character was portrayed with depth. I kept thinking that I should quote this line or that, but this was impossible without giving spoilers. You must read the book to get into each of these characters and to submerge yourself into their lives. The book is not only about thes principal characters but also about what motivates an artist to create. Who is an artist? Isn't it someone who simply cannot stop himself from painting, or playing music, or sculpting shapes, Finished: Excellent writing. Each character was portrayed with depth. I kept thinking that I should quote this line or that, but this was impossible without giving spoilers. You must read the book to get into each of these characters and to submerge yourself into their lives. The book is not only about thes principal characters but also about what motivates an artist to create. Who is an artist? Isn't it someone who simply cannot stop himself from painting, or playing music, or sculpting shapes, or catching just the right image on the film, or simply a dancer who physically CANNOT stop dancing..... There is an urge within that is stronger than everything else. I am so sorry to close the book's covers and leave their world. "Whatever she saw or understood, she decided it was time to stir the pot once more (sir up trouble). For no particular reason but a vague distrust, she did not like me." People tend to feel more at ease with some rather than others. All of us tend to like some particular type of person over another. There is nothing strange about that. But my question is why do some people have to cause trouble for those they for some inherent reason simply don't like? The movie was a total failure in its ability to convey the causes of the characters' emotional undercurrents. It is the examination of these undercurrents that makes this story so marvelous. The movie was very pretty, yes, but that's all. I remember specifically leaving more confused and empty after seeing the movie. Sort of with the question: what was that all about on my lips?! The book has enticed me to go to Delft and see the city where Vermeer worked. It is only 1.5hr from here. This is a "must-do" now. I love the book. I wonder what I will find out. And OMG some people are yucks! 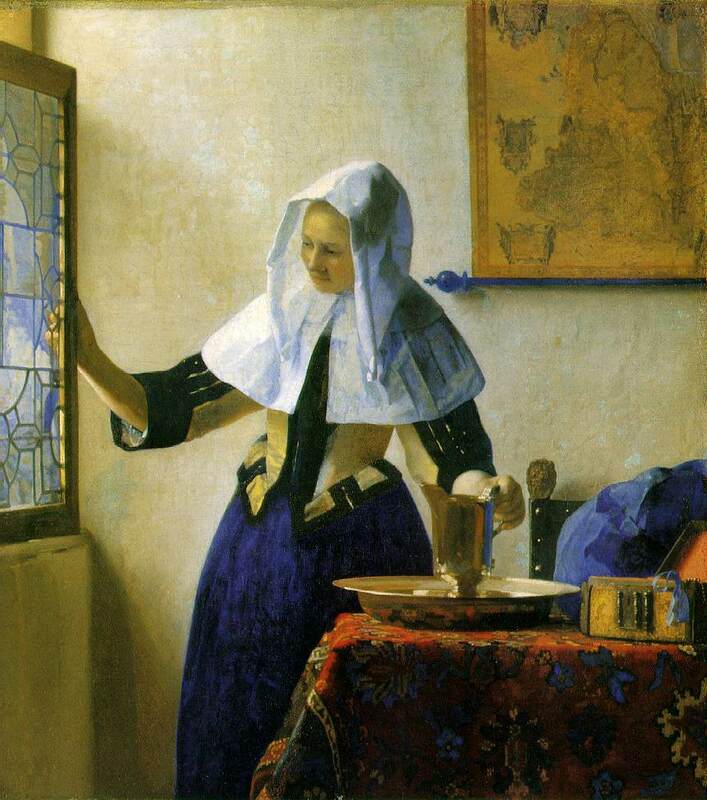 Through page 106: What is the relationship between Vermeer and the maid Griet? THAT is the primary question underlieing this book. This is made clear in the foreword. It arises b/c the painter has managed to make the expression of Griet so intriguing - is she sad, thoughtful, enticing or laughing. Look at the painting and you can see several emotions. So what is going on between the master and the model - some relationship must exist, but what exactly is the nature of that relationship? Known historical facts are lacking. We can only hypotehsize and make conjectures, but thinking about the possibilities is the impetus that caused Tracy Chevalier to write this book. "Sleeping in the attic made it easier for me to work there(near the studio), but I still had little time to do so.I could get up earlier and go to bed later, but sometimes he gave me so much work that I had to find a way to go up in the afternoons, when normally I sat by the fire and sewed. I began to complain of my not being able to see my stitchinging the dim kitchen, and needing the light of my bright attic room. .....I began to get use to lying." "Once he suggested that I sleep in the attic, he left it to me to arrange my duties so I could work for him. He never helped by lying for me, or asking me if I had time to spare for him. He gave me instructions in the morning and expected them to be done the next day." "The colors themselves made up for the troubles I had hiding what I was doing. I came to love grinding the things he brought from the apothecary....I learned that the finer the materials were ground, the deeper the color....Making it and the other colors was magical." From this quote you taste the simplicity, the calmness of the language. You see the love and interest Griet had for the paints and their colors. Questions arise about Vermeer - how could he fail to understand that his additional work demands pushed Griet into an awkward position and even jeopardized her employment in the household? Through page 36: You are right there, in Delft, Holland , mid-1600s. You smell it - the food cooking, the linseed oil in the painting room; you feel the fabrics, the air on your skin; you hear the sound of washing and ironing and cooking pots boiling and children playing and you see all the details you've seen when looking at paintings of this time period. Absolutely marvelous depiction of all the household items, market squares and canals and the paintings hung in every room of Vermeer's house. You feel Griet's fear of the paintings depicting Catholic beliefs - she is Protestant and there remain few Catholics in Delft after the Spanish were defeated.